Where is your slice of the pie? There are a ton of choices for students today. Many careers today didn’t exist when your parents graduated from high school! To make sense of it all, Nebraska developed the Nebraska Career Education (NCE) Model. It breaks up the thousands of careers into six slices of the pie (see below). The center of the pie contains skills that are needed in all career areas so that students will be college and career ready when they graduate from high school. Read on and click below to see how agriculture may be the fit for you! Agriculture is Nebraska’s #1 industry and we need you! So why consider agriculture as a career? Well, it may sound basic, but people like to eat. Oh, and by the way, there will be about 3 billion more people who like to eat by the time you are ready to retire. Agriculture is not going anywhere. In fact, it will have to be one of the most innovative and fast paced industries in order to produce twice as much food on less land! It’s no wonder that agriculture employs one of every three Nebraskans! Clusters, Pathways, and Specialties, Oh My! The Agriculture, Food, and Natural Resources Career Cluster is broken down into seven career pathways as you can see to the right. Within each of these Pathways are tons of Career Specialties, just waiting for highly qualified and motivated employees and entrepreneurs! Added all up, there are over 200 careers within agriculture, employing over 22 million people in just the United States! Agriculture is one of the only industries that has a trade surplus, meaning that we produce more than we consume and are able to sell our product to other countries. In other words, Agriculture makes our country strong! Take a peek at an overview here! Read on below to check out some agricultural careers! There are oodles of great information out there! Here are a few resources that may make it easier to find which career is best for you! National FFA AgExplorer – Search by Career Pathway, likes and dislikes, and more! Goal Setting Guide – set your earning, learning, and living goals! Personal Learning Plan – plan your middle school, high school and post-secondary path! H3: High Skill, Wage & Demand Careers in Nebraska – See what occupations are in demand around you! Want more info? 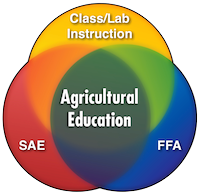 Check out the “Major in Agriculture” and “Teach Agriculture” pages! Your Agriculture teacher, parents, and guidance counselors are great resources, too.